AUSTRALIA has long been a favourite destination for Malaysians, be it for education, vacation, business or migration. Melbourne, in particular, has emerged as the preferred city for not just Malaysians but also Asians in general. Last year, Melbourne was named the world’s most liveable city for the fourth year in a row by the Economist Intelligence Unit. Victoria’s capital city has a population of 4.3 million and for the year ended June 30, 2013, it saw the largest population growth of 95,500 in Australia. A large part of the population growth was driven by international migration. Melbourne is expected to overtake Sydney as Australia’s largest city by 2050. “We are the fastest growing city state in Australia. In 2013, we had 110,000 new arrivals to the state, or roughly 2,000 new arrivals each week. They will need housing, they are going to be taking public transport or driving. So, we have to be able to accommodate that need and ensure Melbourne remains a liveable city,” says Tim Dillon, commissioner for the state government of Victoria. With this in mind, the Victorian government developed Plan Melbourne to guide the city’s housing, commercial and industrial developments through to 2050 and integrate long-term land use, infrastructure and transport planning to meet the population, housing and employment needs of the future. The government has already allocated up to A$24 billion (RM68.4 billion) for new transport infrastructure projects and announced three urban renewal projects — the 20ha E-Gate, the 3.3ha Federation Square East and, the largest urban renewal project in Australia, the 240ha Fisherman’s Bend. To accomplish the objectives set out in Plan Melbourne will require significant investment from the government. However, government and domestic investments will not be enough to realise the plan. “We need to put in place infrastructure to cater for the growing population and also house them, so we need developments. Frankly speaking, we don’t have enough capital just in Australia to do all that. We need outside capital and I think savvy Malaysian and international property developers are seeing this and spotting the opportunities,” says Dillon. He notes that as Southeast Asia and Malaysia grow economically, companies and individuals’ wealth has also increased. “Companies are starting to outgrow the domestic economy and market. In order to maintain their growth, they are looking for opportunities abroad. Most will likely see Australia and Melbourne as safe investment environments — we have had 22 years of continuous economic growth. I think that is attractive to growing companies looking to expand abroad,” says Dillon. Malaysian developers already have a presence in Melbourne. These include S P Setia Bhd’s Fulton Lane and Parque Melbourne, UEM Sunrise Bhd’s upcoming Aurora Melbourne Central and Magna Prima Bhd’s The Istana. “We have seen a huge amount of interest from Malaysian developers over the past two years. I have been stunned by the amount of investment going into Melbourne from developers from Malaysia, Singapore and China,” Dillon remarks. The largest of the three urban renewal projects, Fisherman’s Bend is located to the south-west of Melbourne’s central business district (CBD). Fisherman’s Bend is expected to be home to at least 80,000 residents and create at least 40,000 jobs. It aspires to set a new benchmark for an inner-city, family-friendly living environment that supports a diverse and connected community. “The vision is to have a very compact offering in Fisherman’s Bend comprising residential, offices and retail. It’s going to be a place where people can work, live and enjoy life,” says Dillon. According to him, the Victorian government recently announced a rail link between the city and the airport, and the city link will be stationed in Fisherman’s Bend. “The rail links are being connected. We will have schools and parkland as well. The idea is that people should be able to work close to where they live, so they wouldn’t be spending so much time commuting, which is a major inhibitor on productivity. Long commuting time makes it hard to have work-life balance. So, being able to get all your services and needs close to where you work makes life more pleasant,” says Dillon. The area is currently an industrial precinct with some houses. The plan is to move the industrial precinct further out of the city centre and redevelop Fisherman’s Bend into an urban centre given its close proximity to the CBD (about a distance of 4km). “Fisherman’s Bend is prime land and it makes sense for us to redevelop the area. A decade or two ago, it was harder to move the industrial precinct further out of the city because we didn’t have the connectivity then. We have invested in a lot of infrastructure over the years, so now the industrial precinct can be supported. “We should be using land close to the city for homes and value-added businesses such as services, financial and fund management, which is the largest business in Australia. We just surpassed A$2 trillion funds under management, the fourth largest in the world,” says Dillon. Many fund managers are based in Melbourne and Dillon says it is supported by a stream of high-calibre financial and accounting business graduates from Melbourne’s universities. The draft vision for Fisherman’s Bend Urban Renewal Area dated November 2013 said the project is expected to deliver almost A$2 billion of private investment and create 13,500 construction jobs. The Strategic Framework Plan (SFP) for the area by the Metropolitan Planning Authority adopts four key elements: a street network, sustainable transport, open spaces and a series of places — centres of vibrant mixed-use activity. A new underground station in Montague, which is part of the Melbourne Rail Link project, will be a major catalyst for commercial and residential developments in the area. New tram and bus routes are also being planned and will be integrated with Montague Station and the central city. The projected 40,000 jobs will need new space for office, retail, tourism, education, health and cultural activities. A variety of housing such as high-rise, high-density residences, in the in accessible locations, three to four-level apartments and townhouses will be needed to accommodate the anticipated 80,000 residents. The main retail spine will be in Plummer Street Civic Boulevard while the Montague Station district will be the principal commercial and retail centre. Secondary centres are in Buckhurst Street (Montague) and Lorimer Urban Village. Fisherman’s Bend will initially be built around three places — The Civic Boulevard, Lorimer Urban Village and Montague Urban Village. The Civic Boulevard precinct, which sits in the Sandridge and Wirraway areas, will support the primary transport route for Fisherman’s Bend. It is slated for mixed-use developments with ground floor retail and high-density residences above as well as higher order community facilities. The SFP also asked for the building plates to be flexible — adaptable for office, retail and/or entertainment uses to be clustered around future transport hubs — to allow the boulevard to evolve into a fully activated high street that can serve as an extension of Collins Street. Lorimer is envisioned as a modern commercial and residential hub, which will be enhanced by Lorimer Parkway, a central linear green link. Lorimer’s village centre will be situated in the heart of the parkway and complemented by a range of new urban housing models. As Lorimer is directly adjacent to the CBD, Docklands and Southbank, it is expected to see development early in the renewal project. Lastly, Montague will be a high-density commercial and employment hub located around the new Montague Station and will have substantial housing. The southern section will have a more traditional urban structure, with Buckhurst Street set to become the neighbourhood high street and heart of Montague. The most significant housing growth is expected to be in Buckhurst Street and the north side of Thistlethwaite Street as the lot sizes there are more appropriate for high-rise developments. “The government has in place a plan and guideline for Fisherman’s Bend but it doesn’t own the land. So, it’s up to the developers to come in and determine the opportunities, purchase the land and build the development. The government has a vision, we don’t want 50 schools or 50 hotels. We have to make sure there is a balance in the offerings,” says Dillon. It will be up to the developer to approach the owner of the parcels they are interested in and negotiate a deal. While Dillon acknowledges that it can be a challenge to find the right parcels as there is a mix of large and small parcels, he says the landowners have been generally receptive. The renewal project is already generating interest. Dillon recalls meeting a Chinese developer during a trip to China recently who told him that his company had just acquired a large parcel in Fisherman’s Bend for development. Dillon advises interested parties to do market research on the land prices, get advice from accountants and lawyers, and have discussions with the government early. “It’s up to the developer to decide what to build but it is subject to the guidelines. On our end, we have agencies such as Invest Assist to help facilitate and manage investment projects. Our office in Kuala Lumpur can help developers get the required information and connect with the relevant agencies. We also have a strong team of architects and local consultants who can help with feasibility studies, if needed,” says Dillon. The other two urban renewal projects are smaller in scale and less complicated than Fisherman’s Bend as they are both government-owned land. E-Gate sits on the edge of the CBD, about 4km from the city centre. It is adjacent to the communities of Docklands and West Melbourne, bounded by Footscray Road, Dudley Street, the North Melbourne Rail Corridor and Moonee Ponds Creek. Currently an underutilised rail yards site, E-Gate will be a mixed-use, inner-city precinct comprising retail, residential, commercial and community uses. It will capitalise on its close proximity to the North Melbourne Railway Station, CityLink, tram and bus lines, and the Capital City Trail. There will be a new bridge connecting the site with North Melbourne Station, and West Melbourne will provide primary access to the Metropolitan rail network. E-Gate is expected to bring in A$3 billion to A$4 billion worth of investment to the state and generate more than 5,000 jobs in construction over a period of 20 to 25 years. Expression of interest to develop the site was released on Oct 27, 2014, and will end on Feb 19, 2015. “The other project — Federation Square East — is very centrally located, close to Flinders Station. It’s a beautiful location and very close to our sports precinct. There is major opportunity there for hotels, retail and tourism offerings,” says Dillon. The mixed-use project will revitalise the north bank of Yarra River and better connect the CBD with the city’s cultural, sports and entertainment precincts. 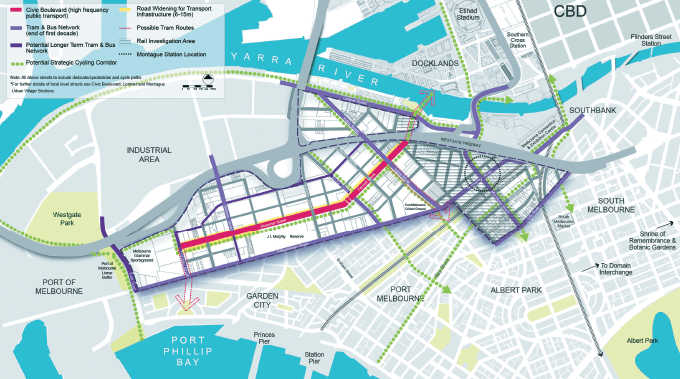 It is bounded by Federation Square/Russell Street to the west, Flinders Street to the north, Batman Avenue to the east and Birrarung Marr to the south. Out of the 3.3ha, about 2.3ha is above rail lines and 1ha is mainly used for parking. Expression of interest was opened on Sept 15, 2014, and closed on Dec 11. “One of the Victorian government’s priorities is to make Melbourne Asia’s most connected and capable city. One of the things that define our city is our multicultural community. There is more than 150 different languages spoken daily in Melbourne. The future is strongly leaning towards Asia, that’s where the growth is happening and where the future multinational companies will come from,” says Dillon. “The key role of our office in Kuala Lumpur is to engage companies looking to expand abroad. We want them to consider Melbourne as an option for future growth and investments. And we will have a full range of correct and detailed information about Melbourne to help them make that decision,” he concludes.